Supplied with a Synscan handset with dual AZ/EQ firmware, it can automatically find and track over 42,900 celestial objects from its database. In EQ mode, the AZ-EQ6GT is designed for either visual use or precise astro-imaging. In AZ mode, it is primarily intended for visual use, and in this mode, two telescopes can be mounted simultaneously in parallel. A great feature of the AZ-EQ6GT is the patented dual-encoder technology. This allows the telescope to be moved manually in either axis without the mount losing its positional information. This gives the user enormous freedom, convenience and flexibility during observational sessions. The Sky-Watcher AZ-EQ6GT.....a new legend is born!! I purchased the Skywatcher AZ EQ6 to replace my ageing black EQ6 which had developed a roughness in its tracking that was almost impossible to autoguide out. I opted for the AZ EQ6 over the EQ6R mainly because of its ability to mount a second scope on the counterweight side of the Dec axis, and the enhanced locking mechanisms on the RA and Dec. I also purchased Skywatcher's pedestal to mount it on. 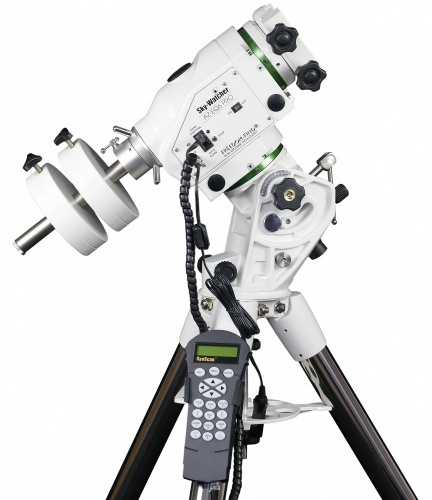 The AZ EQ6 is beautifully made and finished and really looks the part mounted on the pedestal and carrying twin telescopes. I have no intention of ever using it in ALT-AZ mode and, contrary to what you might read elsewhere, you can use it to carry twin scopes in EQ mode provided the second scope is not too long. I use it with a short tube 80mm refractor guidescope, but a 5" Mak will fit as well, even with the mount on its tripod. Using the pedestal allows scopes with longer tubes to be used but I haven't yet tried to see the largest that will fit. 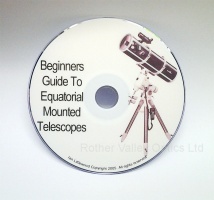 This saves overall weight and strain on the mount when imaging. The improved motors and belt drive really make a difference to the tracking - it's very smooth with low periodic error. Unguided 60sec exposures at 900mm focal length show perfectly round stars, even with no PPEC. It's noticeably quieter too but has a more high pitched whine compared to the EQ6 which to my ears doesn't sound as nice. Altitude adjustment for setting up the mount is now a breeze, so easy compared to the old system. In contrast the polar alignment scope had me perplexed for a while and is a bit of a faff. Gone is the easy to use reticule where you just align the Ursa Major and Cassiopia engravings with their respective positions in the sky and adjust the mount until Polaris sits in the little circle. On the AZ EQ6 I was faced with a basic kind of clock face, a southern sky star pattern, and some dates. Aparently you have to fire up the mount, go through all the inialisation stuff, input all your location and time data into the handset which will then tell you at what position on the clock face to place Polaris. I might end up buying a conventional polar scope ! My only other gripe is that I now need to wear reading glasses to see the characters on the handset whereas I dont with my EQ5 or EQ6 so maybe they have made them a bit smaller or changed the colour. Other than that the AZ EQ6 is a really great mount and I am well pleased with it. Highly recommended.